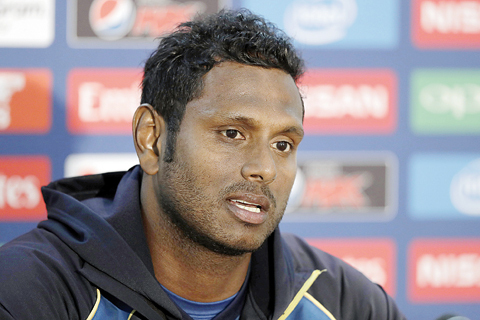 LONDON: Angelo Mathews insists there is no pressure on Sri Lanka in their crucial Champions Trophy clash against India today because the defending champions are expected to thrash his underdogs. Mathews’ side must beat India at The Oval to keep alive their hopes of reaching the semi-finals, but the odds are against a Sri Lanka team hit by injury and suspension. Sri Lanka looked like tournament also rans when they lost to South Africa by 96 runs in their Group B opener last weekend. Already in the midst of a rebuilding project following the retirement of several stars, Sri Lanka will be without Upul Tharanga, banned for his team’s slow over rate, against India, while batsman Chamara Kapugedera may miss out due to injury. Mathews knows India, who thrashed Pakistan in their first group match, are firm favourites to maintain their 100 percent record. But the Sri Lanka captain hopes being written off will allow his team to play with enough freedom to spring a surprise. “People will want India to come in and thrash us, and it’s just all the pressure is off us,” Mathews told a press conference at The Oval on Wednesday. “We are happy to walk in as the underdogs. I mean, no one really expects us to win the championship. Which takes a lot of pressure out of the guys. “We just have to go out there, just express ourselves and be aggressive. “That is our brand of cricket, being aggressive and positive.” Tharanga’s absence is a blow for Sri Lanka and Mathews, who missed the South Africa match due to a calf injury, pulled no punches as he slammed the stand-in skipper and his team-mates for failing to keep up with the required over rate. “The over rate was an issue. It was pathetic. I call it pathetic because of the whole team, and the captain was warned several times, and there’s no excuse at all but to take responsibility for that because nobody else can take responsibility on it,” Mathews said. “The whole team is responsible, including the captain. It’s a very hard job on the field, and he has to look into so many things. “The rest of the players has to support them. Most of the teams play with four seamers and they have not had an issue. While Mathews is aware he is in charge of a largely inexperienced group still finding their way on the international stage, he expects them to rise to the challenge sooner rather than later. “The guys are learning every single day. If you look at most of the guys, they haven’t played a lot of international cricket,” he said. “The more you play, the more you learn. Everyone has to step up with their roles because we can’t just expect things to fall in line. It might be hard to see too many signs of progress against the might of India and Mathews, who will return to the line-up as a batsman but may not bowl, conceded Virat Kohli’s group are formidable. “They’re a force in world cricket no matter where they play. They’ve played fantastic cricket over so many years,” he said.